The name Langendorf exists in the field of vehicle manufacturing for more than 100 years and it ranks with the internationally renowned producers of the individual vehicle manufacturing. We are very proud of that fact and at the same time we are carrying an obligation. 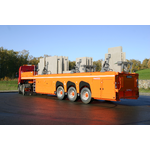 Our product range includes commercial vehicles of the section tipping semitrailers with aluminium or steel body, tipping trailers, Innenladers for transporting glass or concrete parts, double-deck Innenladers, low-bed semitrailers, low-bed trailers and special vehicles. In our works at the locaction in Waltrop we are continuously pursuing new ways to push innovations and to translate detail improvements into action. For this we are using up-to-date technical means and thought-out production and service processes. Langendorf is one of the top vehicle manufacturers in Germany, more than ever sets priorities in the field of tipping trailers and is the market and technology leader in the field of Inloaders. Langendorf supplies nearly all European markets and also is active on all continents particularly with the approved Inloader technology. We are looking worldwide for partner for selling, repair and maintenance our high-tech trailer.